Does God still guide and lead his people today? Indeed, he does, and this stirring volume describes Edward’s encounters with the living God along the winding road of his own spiritual journey over 50 years. It will also inspire you to seek and to expect divine direction in your own life. The book focuses on practical ways that God leads his people, some channels of his divine guidance. 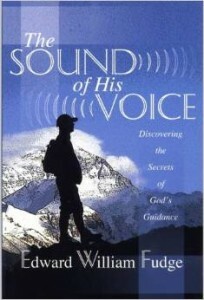 ORDER The Sound of His Voice here. 10. Could this be prophecy? 11. Obey–God is at work! I opened this book at 10:00 p.m. and absolutely could not put it down until I finished it at 2:15 a.m. It has encouraged me to be bolder and more expectant in prayer. I feel as if I had just received a precious, intimate letter from a dear friend! Thank you for putting this down on paper for me to read and savor and share. I've been refreshed and restored, and cried some tears too. This testimony came just when I needed it -- that God is alive, that he cares for us, and that he is profoundly involved in our lives. I read it straight through an evening and my wife finished it that same night. It is a deeply moving work. What a great job in expressing what a relationship with God can be when it is based on love and not on fear.